마이캠핑카 > 캠핑카만들기 > 폭스바겐 미니버스의 배치도 입니다. 1. Sink cabinet including gas stove, sink, cooler, and a storage cabinet. 2. Storage chest with water tank and storage space. 3. Clothes closet with rod and vanity mirror. 4. Linen closet. Ceiling cabinet or air conditioner. 5. 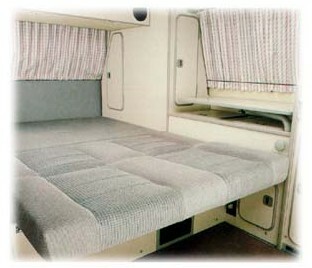 Rear deck mattress (combines with 7 to make the double bed). 6. 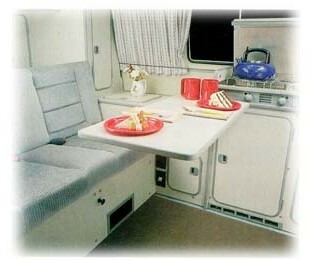 A second bed forms on top of the camper when the pop-top is elevated. 7. Rear bench seat with storage locker.